I’ve seen independent consulting firms pass through periods of severe, belt-tightening on their journey to booming success. On the other hand, more than one consulting firm’s revenue has plunged from $20 million to a few million dollars before culminating in a total, permanent shipwreck. If your revenue is soft now, what does the next quarter hold? Are you in a temporary lull or headed for doom? Five questions predict whether your firm is going to crash against the rocks or is headed back to smooth sailing. Question #1: Can you reach new decision makers in the market you’re targeting? Yes Your dip in revenue may be temporary. Answer question #2. No You’re facing a brick wall. Reexamine your target. Question #2: Do you have evidence that clients will pay to solve the problem you’re solving? Yes Your dip in revenue may be temporary. Answer question #3. No You’ve been lucky so far, but the ride is over. Reexamine the focus of your firm. Question #3: Do you have evidence that clients will pay you to solve their problem? Yes Your dip in revenue may be temporary. Answer question #4. No Your positioning is choking your pipeline. Reexamine your offering and/or your presentation of that offering. Question #4: Are you creating action on the left side of your funnel? In other words, are you building visibility and creating conversations with decision makers? Question #5: Are you closing opportunities? In other words, once a specific opportunity is identified with a prospect, are you closing the deal at least 50% of the time? 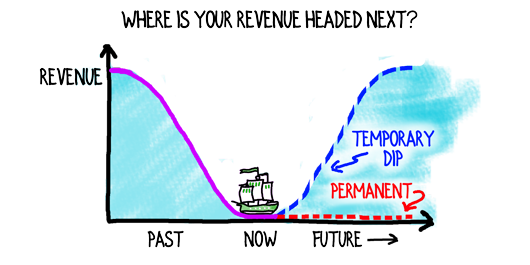 Yes You’re temporarily caught in a revenue trough. 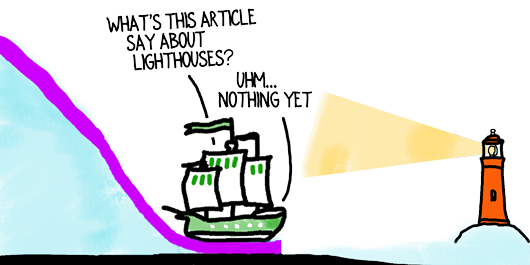 This is the nature of sailing the consulting seas and is common to firms of all sizes. Take a deep breath and stay the course. What other questions does the five-point diagnostic raise for you about your firm? David. Yes indeed. A sales pipeline is basically this if you don’t tend it: garbage in, garbage out. Now I think I have to stop reading and get cracking on meetings with new prospects. There’s a balance between quantity and quality in consulting sales funnels–mostly because it’s difficult to know for sure in advance who may turn into a good client. As I mentioned in a recent article, even small companies who don’t appear to have a deep pockets can turn into large clients. IF, you’re solving an urgent, important problem for them. Thanks for adding to the conversation. Crack on, Paula! “Do you have evidence..” questions are mostly about looking into the past. Answering yes to those do not mean they hold good for the future. As they say in investing, past performance is no guarantee of future success. That’s as true in consulting as any other part of life. However, past behavior is still usually the best indicator of what’s ahead, and that’s also true in consulting. If you’ve won business in the past, you have the ability to win it in the future. If clients have paid to solve a problem in the past, in all likelihood other clients will pay to solve that same problem in the future. Recurring problems are far more prevalent than one-off problems. My years in marketing research also taught me that asking people about the future yields notoriously bad results. Therefore, looking in the rear-view mirror while keeping our eye on the present generally will indicate the near-term future. Thanks for bringing up the past vs. future discussion, Vijay. Vijay, the full start of the questions – “do you have evidence that clients will..” – is about the future. On the truncating path my the ultimate question is “do you?” If your answer to this question is “yes” all following questions are much simpler to answer. David, Please say more about question #4, “the left side of the funnel”. Debbie, the left side of the funnel holds the broad universe of opportunities you’ve created to win projects. Every relationship in your Network Core is represented there. People who watch you speak, read your books, participate in a forum with you, etc. are entering your funnel at the left. The opportunities gradually work their way right, stage by stage, with many falling out along the way, until you close your engagements. I’ve promised a CRM webinar in the very near future (Summer, 2017) and the funnel will be more clear if you attend that.